Preheat oven to 425°F and spray a baking sheet with non-stick spray. Sift and mix together the flour, xanthan gum, salt, and baking powder. Use a pastry blender or fork to cut the butter into the flour mixture until the butter is smaller than the size of peas. Stir in the milk until completely incorporated. The mixture will be a bit wet and sticky. 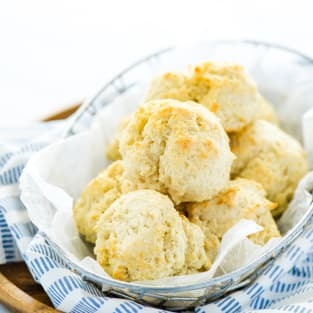 Use a spoon or large scoop to drop the biscuits onto the prepared baking sheet into 2 rows of 4. Bake the biscuits at 425°F for 10-14 minutes or until done in the center. Mine were done in 12 minutes. Serve warm or room temperature. For best results, use Sharon’s Brown Rice Gluten Free Flour Blend.